Some of the fastest-moving things in the world are also the most important, like electrons, which bind atoms together into matter. Flash photography can be used to see things that happen too fast for the eye to follow. CQD hosts the Australian Attosecond Science Facility, Australia’s fastest camera flash. The powerful laser at the heart of this facility lets us see electrons moving inside atoms and molecules. We investigate the highly non-linear interaction between ultra-fast and ultra-short light pulses, and matter. The light pulses are only a few millionth billionth's of a second in duration and we can use them to create new forms of X-rays, to understand how electrons move around atoms and molecules, and even to attempt to create a nuclear transition using light. We have Australia's most sophisticated laser system, sometimes called Australia's fastest camera, in our laboratory, the Australian Attosecond Science Facility. precision measurement of attosecond dynamics. Professor Robert Sang at the Attosecond Science Facility talks about the world's fastest camera at Griffith and how it films the atomic universe. Professor Robert Sang is the Dean, Academic, of the Griffith Sciences Group. Professor Sang is an experimental quantum physicist and he co-founded the Attosecond Science Group at Griffith University. Attosecond pulses can help us take snapshots of electrons in motion, unlocking the mysteries of chemical bonding. We use the AASF laser to create extreme ultraviolet light pulses that last a few hundred attoseconds. If we imagine slowing down time so that one second lasts the age of the universe, an attosecond pulse like this would last only about a minute. To make these attosecond pulses, we use the powerful AASF laser to rip the electrons off of atoms and smash them back together. When the electrons and atoms collide, they produce bursts of ultraviolet light. Controlling the exact shape of the AASF laser pulse lets us isolate a single burst. The interaction of ultra-short pulses of light with matter has mainly focussed on the interaction of the light pulses with atoms or molecules in their lowest energy states or their ground states. In this project, we investigate the ionisation of atoms in excited states using highly-amplified and ultra-short light pulses which allows us to investigate the ‘over the barrier’ ionisation. In this interaction the distortion induced by the ionising light field is greater than the binding potential of the atoms. We can also investigate the role of electron spin and the atomic target structure in the ionisation process. In our experiment we use target atoms from an enhanced beam of neon atoms in excited metastable states (long-lived excited states). The beam has been enhanced using atom optics based on laser cooling techniques. This is the only laboratory in the world that can currently perform this experiment. Chemical transformations and reactivity are determined by ultrafast motion of electrons in molecules. That motion usually occurs on a timescale of few femtoseconds (10-15 s), or even faster in the attosecond (10-18 s) domain. We study these dynamics by using ultrashort laser pulses in pump-probe configuration and analyse the reaction fragments with a reaction microscope. We also explore various means for controlling the motion of electrons in molecules. In particular, we employ different coherent control schemes (i.e. carrier-envelope phase, two-color pulses, pulse shaping) to influence outcomes of photochemical transformations in molecules. 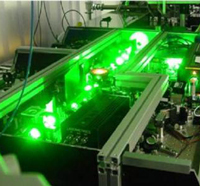 The behaviour of atoms in powerful laser fields is the key to attosecond science. Although this behaviour has been studied for many years, it is still not completely understood. We use the simplest atoms of all, hydrogen atoms, to make precise measurements of attosecond dynamics. Accurate theoretical calculations in this area can only be carried out for hydrogen. By testing theories against our accurate data, we can help develop new ways to predict the behaviour of more complex atoms and molecules. Our data can also assist other researchers, letting them compare their results with a well-understood standard.